2016's reading continues to be rewarding, and though perforce less swift now that I'm no longer on holiday, still moving along at a steady clip. This bunch of books includes several that I can already tell will be on my list of favorite reads at the end of the year. The Portable Veblen by Elizabeth McKenzie - This spring's it-litfic comes with blurbs by Ursula K. Le Guin and Karen Joy Fowler, and has a quasi-literary, quasi-romantic, quasi-slipstreamy premise that seems instantly appealing. The novel spans the short but eventful engagement of Veblen, an underachieving temp worker and sometimes translator who lives in a storybook house in the woods and talks to squirrels (who sometimes talk back), and Paul, a neurologist whose new gadget to prevent traumatic brain injury in the field has been picked up for testing by the US military. Right off the bat, the book feels like an invigorating blend of the personal, the political, and the topical. Veblen, whose retiring, accommodating nature is the product of years of emotional abuse by her narcissistic mother, whom she has only barely managed to escape in her adulthood, is simultaneously a dreamer and a clear-eyed critic of our society's ills. Part of her inability to engage with the world is rooted in her awareness of how society immediately capitalizes and monetizes anything good--such as Paul's gadget, whose good intentions are immediately transformed into a moneymaking venture--and how much of our public discourse is merely thinly-disguised advertising. Paul is struggling with the same questions, seduced by his employers' promise of wealth and dreaming of an affluent suburban life with Veblen, while also dimly sensing that this is not what she wants. The early chapters create the impression of a comic social novel, along the lines of Dexter Palmer's Version Control, which effortlessly blends the counter-factual and mundane. It doesn't take very long, however, for The Portable Veblen to get bogged down in the waters of cuteness. The book that I ended up comparing it to was not Version Control but Where'd You Go, Bernadette, in that like it, what initially seems like an engagement with social issues quickly becomes a solipsistic examination of the difficulty of living in the world when you're a white, upper-middle-class Northern Californian who is so much smarter and more creative than everyone else. Like Bernadette, Veblen ends up focusing its story on the restoration of family--which means that it is far more forgiving of Veblen's mother than I think is warranted, and even Paul's relatively-nurturing parents, who have nevertheless spent his life neglecting him in favor of his disabled brother, get off pretty lightly. McKenzie is clearly trying to tell a coming-of-age story for both of her protagonists, who have to put behind their many justified grievances against their parents and learn to relate to them as adults, but this feels like a much smaller, lighter-toned story than the one the novel initially seemed to be telling. In its final chapters, The Portable Veblen doubles down on its comedy (including a rather gruesome ending for one of its villain characters that hardly feels earned, or in keeping with the rest of the novel's tone) and its romance, seeming to suggest that Paul and Veblen can overcome the inescapable problem of living in late-era capitalism by sheer virtue of their specialness. The book's epilogue finds them living in Scandinavia, engaged in the kind of virtuous, rewarding, and not very taxing occupations that people in romantic comedies are constantly having dropped in their laps. In the moment, this feels totally earned--McKenzie is good at getting us to care for both of these people, and to want good things for them--but the further I get from the book, the more curmudgeonly my reaction to it becomes. What started out as a story with something to say about the world ends up as a story about two privileged, fortunate people, and to me that's decidedly a devolution. High Aztec by Ernest Hogan - I'm indebted to Vajra Chandrasekera for alerting me to the existence of this novel, which was published in 1990 and seems to have been undeservedly forgotten. It's not a perfect work--there's a lot more worldbuilding than there is plot, and even at a mere 200 pages the book ends up outstaying its welcome--but there's a lot here worth reading for, that not many other writers today are doing. Set in the mid-21st century after the collapse of the US, High Aztec imagines a Mexico in which the Aztec culture, religion, and language are experiencing a revival. This has led to profound social unrest, with rising tensions between different Aztec revivalist groups, and between them and mainstream society and government. Our protagonist is a feckless, atheistic artist who becomes infected with a virus that makes him believe in the Aztec religion, which makes him valuable to almost every power in Mexico City (or Tenochtitlán, as the novel calls it). He bounces from one pair of hands to another as his infection deepens and his view of the world is overlaid with hallucinations of the gods of the Aztec pantheon. Though not strictly a work of cyberpunk, High Aztec has the strong flavor of that genre, with its emphasis on an on-the-ground exploration of how technology and social changes affect the lives of people on the margins of society (in that sense, it reminded me strongly of Lauren Beukes's Moxyland). The guided tour of religious cults, street gangs, criminal organizations, and sinister government facilities eventually pales a little, as does our protagonist's increasingly addled state of mind, but High Aztec is nevertheless a great example of the kind of SF novel that gets its power simply from exploring its setting--an exploration that is only made more enjoyable by the wit and irreverence of our viewpoint character. If I have one complaint, it is that women in this novel are rather flat characters, driven primarily by their desire for men, and described solely in terms of their attractiveness (some of this has to do with the protagonist's own limitations, but Hogan doesn't do any work to suggest that there's more to the women he meets than he realizes). It's an unfortunately glaring flaw in what is otherwise a fascinating and unusual novel. Lady Susan, The Watsons, and Sanditon by Jane Austen - I don't know why I've been so resistant to reading Austen's three "official" unpublished works. Maybe it was the knowledge that the latter two were unfinished at the time of her death, and that I'd therefore end up craving an ending that would never come. Or maybe it was the awareness of how much revising and reworking went into making Austen's published novels as perfect as they are, and a fear that what I'd get from her leftovers would be, at best, Austen-lite. In the end, it took Whit Stillman's forthcoming adaptation of Lady Susan, Love and Friendship, to get me to discover the original, and though I'm not sorry that I've done so, it's easy to see how this novella works better as a starting-off point for someone else's story, than as a story in its own right. Written in an epistolary format, Lady Susan follows the title character, a beautiful but impoverished widow, as she flees the home of the married man she's been carrying on with for the relative safety of her brother-in-law's house. Susan's main objective in life to marry off her inconvenient daughter Frederica to a rich but empty-headed baronet whom the girl despises. But while she's in her brother's house, she resolves to revenge herself on her sister-in-law, Catherine, who has always looked down on Susan's flirtatious, amoral behavior, by seducing Catherine's morally upright, judgmental brother Reginald. For a work that was probably written when Austen was a teenager and then abandoned, Lady Susan is remarkably accomplished. Though its tone is more reminiscent of Austen's broader novels, like Northanger Abbey, it already features her impeccable command of language and tone, the ability to convey her meaning perfectly with a few well-chosen words (though it must be said that this control falters near the end of the story, when the epistolary format rather gets away from Austen, and she wraps up the narrative in an epilogue that feels more dutiful than artful, as if she just wanted to get the business over with). The chief appeal here, unsurprisingly, is Susan herself, who is a remarkably rounded villain. Manipulative and calculating, she proceeds through Regency society like a grandmaster at a chessboard, casually discarding a pawn or accepting the loss of a piece, and reacting philosophically to temporary defeats because she always believes (rightly, as it turns out) that she can turn them into victory. I was reminded a great deal of Sense and Sensibility's Lucy Steele, which makes sense because that novel was also originally written as an epistolary work, which in both cases seems to have forced Austen to give more thought than she usually does to the inner life and humanity of her villains. And Susan is, despite her calculations and cold-bloodedness, undeniably human: very funny in her assessments of everyone around her, and surprisingly honest about the often-petty motivations that drive her behavior. Unlike other Austen characters on the make, the older and perhaps wiser Susan isn't looking for one final score, but mainly for a bit of fun, because she knows and accepts that it will never last. Perhaps unsurprisingly, the problem with the story turns out to be everyone else in it. The critic Q.D. 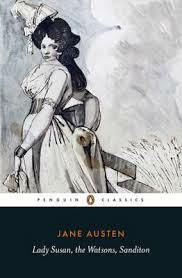 Leavis called Lady Susan a dry-run for Mansfield Park, and one can certainly see the truth in that. You only need to flip the perspective of this story, about a witty, amoral woman who upends the norms of a sleepy country estate and captures the heart of a priggish man who keeps trying to convince himself that there is some goodness in her that simply doesn't exist, to get to Austen's most controversial novel. The key difference between these two works, however, is that Susan takes up all the air in her story. Between them, Catherine and Frederica split the role that is played by Fanny Price in Mansfield Park, but neither of them achieves the frustrating complexity of that character--Catherine is too savvy, and too untouched by Susan's machinations, and Frederica has all of Fanny's outward milksop appearance, and none of her slightly-scary strength of will. Reginald, meanwhile, barely even registers, a quality he shares with all the other men in the story. In fact, one of the things that most distinguishes Lady Susan from Austen's published novels is how little the women in it seem to think about men. Oh, the men are always the pretext for the story--they need to be trapped, or saved, or fobbed off--but the relationships in the novel, and of course the letters that give it its form, are between women, perhaps most interestingly between Susan and her equally immoral and rather bored friend Mrs. Johnson. It's a quality that I wish was more present in Austen's more polished works, for all that Lady Susan never approaches their other accomplishments. The Watsons and Sanditon are both fragments, the opening chapters of novels that Austen started and abandoned, or, in the latter case, died before she was able to finish. Both are tantalizing, but in very different ways. The Watsons, written when Austen was about 30 and living in Bath, feels like a classic, quintessential example of her work (which is all the more surprising when you remember that this was a fallow period, both creatively and emotionally, in Austen's life). Its central event is a country ball attended by Emma Watson, who has recently returned to the home of her impoverished family, after spending most of her life as the ward of her relatives. When her adoptive uncle dies and her aunt remarries, Emma finds herself cut off from her expected inheritance, and forced to return to a home and a family she barely remembers. The ball is Austen's way of introducing us to the three or four families who will make up this novel's business, but also of establishing the fact that Emma, though lonely and out of place, is self-possessed and has a strong moral code. This puts her at odds with her family, and particularly her sisters, whose blatant husband-hunting she recoils from. The opening chapters set up several interesting avenues of story, none more so than the relationship between Emma and her oldest sister Elizabeth, who though lacking Emma's refinement has a clear-eyed pragmatism that the younger woman lacks. Since none of this will ever be resolved, what's left is to enjoy in these chapters is Austen's clear control of her material, the way she effortlessly sets the scene and establishes a scenario in only a few short chapters. Sanditon, on the other hand, feels like a huge departure. When reading The Watsons, it's very easy to guess how Austen would have developed and ended the story, but Sanditon is very different from anything else she ever wrote, more a social novel than a novel of manners, and more strongly comedic than any of Austen's published works. This is particularly notable in the way that the fragment fails to develop, and indeed seems rather uninterested in, its heroine, Charlotte Heywood, who travels to the titular resort town with friends of her parents, and there encounters a wide array of ridiculous characters. The actual subject of the novel seems to be Sanditon's rapid development, from a sleepy village into a tourist destination, and the various forces driving and impeding that transition. Charlotte's host, Mr. Parker, wants to build up Sanditon's reputation and bring more visitors to it, because he believes in progress, and believes it will prove a social good. His partner, Lady Dunham, is a skinflint who resents the possibility that prosperity might give her social inferiors ideas above their station. Both are surrounded by hangers-on who are each ridiculous in their own particular way, and whom Charlotte observes with growing bewilderment. At the end of this fragment, it's almost impossible to guess where Austen would have taken her story--for one thing, because though she has introduced several young women into Charlotte's circle, there are hardly any eligible men in it. It is, however, exciting to discover that Austen was stretching her wings and exploring new possibilities as an artist, and is yet another reason--if more were needed--to regret that her life and career were cut so short. Cuckoo Song by Frances Hardinge - At first glance, Hardinge's next-to-last novel feels very much of a piece with last year's The Lie Tree. In both books, the elaborate and detailed fantasy worlds that have characterized most of Hardinge's previous work are replaced by a real-world setting (albeit a historical one--Cuckoo Song takes place a few years after WWI, whose shadow lingers over its events). This was a disappointment to me in The Lie Tree, since Hardinge's ability to work out the rules and customs of fantasy worlds that also happen to be utterly bizarre and unlike those created by any other writer is one of my favorite things about her. That Cuckoo Song was, like The Lie Tree, more rooted in horror than in fantasy, and locked in a tight third person on a young heroine who teeters on the verge of becoming a villain, led me to expect a very similar reading experience to The Lie Tree, which I liked but didn't love nearly as much as Hardinge's other books. To my surprise and pleasure, however, Cuckoo Song turns out to be a more complex work than I initially suspected, and far more elaborately worked-out than its opening chapters suggest. Our heroine, Triss, wakes up after an accident with a fragmented memory and a sense of overpowering strangeness. As the days pass, that sensation deepens, especially as her younger sister Pen keeps treating her like a stranger and an interloper. The seeming normalcy of the book's opening chapters turns out to be a reflection of Triss's sense of self, which disintegrates as she learns more about her accident--and about her own nature. Peeling back the layers of her identity requires Triss to delve beneath the normal surface of her world and discover the strangeness the lies just beneath it, a journey on which we join her. By its midpoint, Cuckoo Song's apparent realism has cracked to reveal such deranged elements as a movie theater where silent-film characters try to drag the audience into the screen, letters from the dead delivered by winged creatures with the faces of old women, cities full of elves and demons hidden in the cracks and corners of human ones, and a girl made of leaves and thorns who can devour almost anything in her quest to stay alive. Hardinge's gift for invention turns out to be even more effective as an engine for horror than for fantasy, but underlying the horror of her fantastic inventions is the horror of abuse. Triss is a child in a world that leaves very little space for children, that treats them as inherently untrustworthy and casually hands them over to plausible-sounding adults who mean them harm. Her parents, unable to cope with the loss of their oldest son in the war, have warped both of their daughters with emotional manipulation and gaslighting, and Cuckoo Song is squirmingly effective at conveying the sense of claustrophobia and isolation that dominates in their home. When the girls are thrust into the world without protectors and facing terrible danger, it's still a relief, because they're finally able to direct their own lives instead of living under the control of untrustworthy and sometimes harmful adults. Like most Hardinge novels, Cuckoo Song doesn't pretend that it is possible to fully heal from this kind of damage, but it also offers the hope that some grown-ups can be trusted to treat children like people, and that with their help, both Triss and Pen can find their way back from the things that were done to them, and the things they've done. 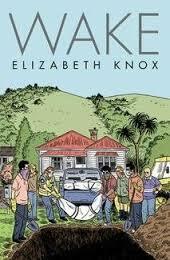 Wake by Elizabeth Knox - Knox is turning out to be one of those writers who never writes the same kind of book twice. I'm still in the early phases of my journey through her bibliography, but already I've encountered a YA fantasy (Mortal Fire), a historical romance (The Vintner's Luck), and now, with Wake, a tense, can't-put-it-down work of psychological and supernatural horror. Even as she jumps effortlessly between genres, there are some underlying Knox-isms that shine through all of her work, such as a commitment to low-key, naturalistic emotion even in the face of the utterly bizarre or devastating, a sly and often dark sense of humor, and a determination to work through the cosmology of her strange and fantastical premises (the McGuffin that drives the events of Wake even feels slightly connected to the setting of Mortal Fire, both of which have to do with alternate realities). Wake begins purposefully, and with an intensity that lays out the novel's intentions. On an ordinary morning, every inhabitant of a small New Zealand town is driven suddenly and incurably mad. Within an hour, they're all dead, either through violence or by having simply stopped breathing. The only survivors are thirteen people who happen to have arrived at or returned to the town after the madness began, and who now find themselves trapped by an invisible force field that surrounds it. It's a premise that owes a great deal to Stephen King (most obviously his 2009 novel Under the Dome), and throughout the book there are other flashes of King-isms, such as a fascination with the scatological (in a harried, horrible sequence in which the survivors' food is poisoned) or a character who seems to suffer from multiple personality disorder. But King hasn't been this compulsively readable in decades, and more importantly, Knox's project with this novel seems to be a deliberate rebuke to the assumption made by him, and other horror writers, that the immediate response of people under pressure, and in the face of impossible situations, is to lose all semblance of humanity. The survivors in Wake are sometimes fractious and unpleasant, but they never devolve into savagery. Even when they argue--over how to act or who gets to give orders--they manage to do so like adults, and with the obvious recognition that they'd all rather stick together, not just for safety, but for the comfort that human bonds and company give them. This is not to say that Wake is a mild novel or lacking in human drama. On the contrary, the very fact that the survivors don't end up at each other's throats makes their conflicts all the more intense and hard to read about. Under the right circumstances, the survival of civilization turns out to be just as horrifying as its breakdown, as the survivors insist on maintaining normal modes of behavior in a situation that grows increasingly hopeless. Most of the first half of the novel, for example, is taken up with a discussion of whether and how the survivors should bury the hundreds of bodies scattered throughout the town, and the toll that this act of humanity takes on them--the resentment they feels towards those among them who suggested the plan and seem confident in it, and the coping mechanisms they come up with to deal with what they see and have to do--is all the more brutal for Knox's refusal to sensationalize it. As the characters themselves begin to die--from self-inflicted wounds which may be a normal human reaction to horror, or a recurrence of the madness that took the town--they have to start wondering what the purpose, or meaning, of survival in their situation even is. In its final chapters, Wake's existential horror gives way to a more concrete explanation of what happened to the town and what the survivors are facing, that might, in another book, have felt like a letdown--like Knox backing away from her exploration of how humans behave in the face of certain death with a choice to make that death a little less certain. But the unflinching brutality of the preceding chapters--a brutality that is made all the more punishing by the mundane, matter-of-face way in which Knox presents it and the characters react to it--makes this release valve necessary. Knox has worked so hard to make her characters human even in the face of an inhuman set of events, that it would be cruel and punishing not to give them at least a chance of surviving them. It's not a perfect ending--in particular, the way it uses a mentally disabled person as a means to an end is a King-ism that Knox might have done well to leave by the wayside--but it's precisely the one that her characters have earned. 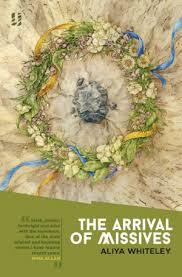 The Arrival of Missives by Aliya Whiteley - Whiteley's latest novella is--deliberately, one imagines--very different from The Beauty, one of my favorite stories of 2014. That story was suffused with claustrophobia, body horror, and a sort of queasy eroticism. The Arrival of Missives, in contrast, starts off extremely proper. But that's because it's told by an extremely proper young lady, Miss Shirley Fearn of the village of Westerbridge. It is just after the end of the first world war, and Shirley--bright and earnest, clean of mind and body--is full of plans for how to make the world a better, more peaceful place. These plans are bound up in Mr Tiller, the local schoolteacher and a wounded veteran of the war, whom Shirley idolizes and loves. When Shirley discovers a horrible secret about Mr Tiller, she's driven by both love and idealism to not only keep the secret, but enlist herself in his mysterious agenda--an agenda, he tells her, which is guided by messages from future, instructing him on how to save the world. The early parts of The Arrival of Missives are a bit hard to get through, not because they're badly written, but because Whiteley so perfectly captures Shirley's earnestness and iron-clad certainty, and these are a little hard to take. This, however, makes it all the more powerful when Shirley, under the twin pressures of Mr Tiller's mission and her growing realization that her parents have her life all planned out for her, starts to stretch her wings as an adult, and to discover her power to affect the world--as well the very real limits put on that power by her youth and gender. The very certainty that initially makes Shirley seem naive and childish becomes something more complicated when she begins to feel out her desires--for a place in the world, for a sense of importance, and for control of her own body and sexuality. Slowly but undeniably, she grows into a heroine who is capable of seeing the adults around her, including Mr Tiller, more clearly, and to make decisions not only for herself, but for the future of humanity. The Arrival of Missives is a lot of things, and among them is the origin story of a heroine whose power comes from recognizing and respecting her own wants, and not cancelling them because society or propriety tells her that she should. I don't know if Whiteley plans to tell other stories about Shirley--certainly she's left the door open for it--but whether or not she does, it's easy to imagine her having a heroic, adventurous life. 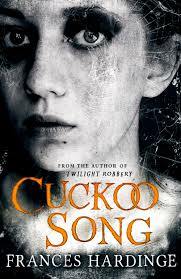 Cuckoo Song has been my favorite of Hardinge's novels yet.